The wooden paneled floor creeked with each step of Marcus' mud stained boots. The saloon fell quiet as the renouned outlaw stepped towards the bar, plopping himself down on the worn stool. "What'll it be today Marc?" The bartender asked as he cleaned the inside of a mug with a worn towel. Marcus' eyes scanned the room as it filled with chatter again, "The usual Pete." His low voice grumbled in return. A few moments later a tall glass of frothy liquid slid his way. "So whats the gang up to these days Marc? Lootin'? Robbin'? Stealin'?" The man asked as he placed both hands on the counter, leaning forward some. "The usual." Marcus replied, taking a long sip from his drink. He set the glass down as his eyes turned up towards the bar keep, tilting his hat upwards to reveal his whole face. "Though i reckon it wont be that way fer much longer." By my short halfassed intro im sure you can tell that this will be a 'Wild West' RP. Our story follows the renoun gunslinger Marcus Teller and his ragtag group of misfits. The likes of who are looking for one last score in hopes to get out of the life for good, atleast most of them. I do have a plot in mind, for those who are interested, although id like to keep it close to my vest. As those who know my rp's, things arent always as they seem. Anyway, for those who would like join, you may be a part of Marcus' gang, or one of the many bounty hunters/law men after him and his group. As i intend to develop this world other characters may ne appropriate, such as shopkeeps who tend to get involved, travelers, prostitutes, etc. Anything that fots the time period. I am very excited and enthusiastic about fetting this off the ground, so to anyone who may want to join, please be serious about staying aboard. If you are unsure, i suggest you just read along instead. With all that said, here is the CS. Susanna, preferably called "Birdie", is a bit of an odd one. She fits the female assassin stereotype of killing her victims by way of seduction and a quick (or slow) slice with a knife, and it's very clear that she enjoys this way of life. Or, at least, she once used to. Unbeknownst to pretty much everyone, Birdie wants to retire to a life of peacefulness and a small family. Gaining enough money will land her there for sure, but it might take a while. Besides her lifelong dream and current situation, Birdie can hold a rather pleasant conversation and is a delight to talk to if she isn't purposefully keeping secrets. She's a bit of a trick to figure out. Gang member status: Birdie is a tad eccentric for what she does, but she appears to be alright. However, she does have plenty of secrets, and no one truly knows when or how she is going to strike. She currently has a $1500 bounty for her, dead or alive, for excessive counts of murder, blackmail, theft, and several other heinous acts. Weapons: A '66 Winchester .44 caliber lever-action rifle and two S&W Model 3's. A small knife is strapped safely and securely to her thigh in case there is any need for close combat. Bio: It's said that dear little Susanna Burnett was as tough as they come. The eldest of a family with seven children, Susanna was already destined to a life tending only to children and wifely duties. As life went on and she got older, the young woman began to see her potential being somewhere outside of the Burnett family home, someplace where she could leave and freely explore the great Wild West. Purposefully disobeying her parents, seventeen year old Susanna stole a horse and left home, riding off into the night with nothing but her father's rifle, a few day's rations and the clothes on her back. Since that moment, Susanna taught herself how to survive in the world of cowboys and gunfights. She was able to find her spot as a little-known yet effective and alluring assassin with information on just about everyone and everything. Because of this, she was often referred to in conversation as "a little birdie told me...", hence the reason behind her brand-new nickname. One night, Birdie was sent to kill a U.S. marshal that was sticking his nose where it didn't belong. However, the man was much more clever than he let on, but he saw Birdie as an opportunity to escape the life he had as a marshal. Since then, Silas Turnbull and Birdie have traversed the Wild West together in search of their American dreams. Personality: A former man of the law, Silas is a silent participant of Marcus' gang that would much rather stay away from being around the locals. He is big and intimidating, but in reality he doesn't talk much or go looking for more trouble than what's worth. Silas is a man of faith and honor. With his morals clashing with his career, the ex-cop will go out of his way to make sure that no bystander is harmed and will spare lives wherever possible. He is merciful and about as much of a pacifist as one can get. However, once a civilian comes into the mix, Silas can become a big, big threat to those that wish harm to them. Gang member status: Though he doesn't speak much to the others, Silas is seen as a trustworthy and strong individual. Though his past as a police officer may cause some underlying worries, he hasn't done anything yet to show that his intentions are any different from the rest. There are no bounties on him, but some criminals seek him out to pay for his acts of virtue. 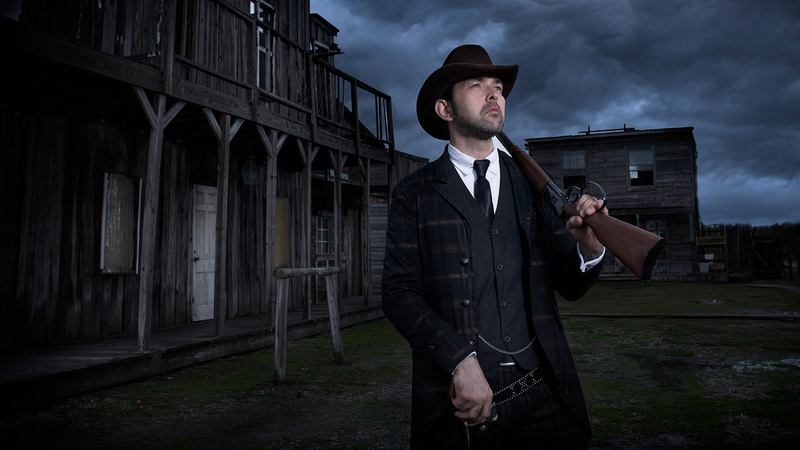 Weapons: A Colt Single Action Army, a sawed-off double-barreled shotgun, a hatchet, and his prized Colt Paterson. Bio: Living as a black man in the old West isn't exactly easy for old Silas Turnbull. He is a man of many stories and conflicts, but ironically he is also a man of few words, and so very few people know a whole lot about him. What is speculated by those closest to him is that he was born a slave and was freed at a young age, though he was already separated from those he loved. Feeling the urge to help those who couldn't help themselves, Silas went into law enforcement and became a police officer. It was for ten long years he would serve in this line of duty before pursuing a higher rank, soon finding himself in the rank of U.S. marshal. Silas soon found that this job wouldn't do much for what he had in mind. He preferred to protect the innocent and provide a quick hand of justice to those who wished harm unto others in such a cruel manner. Lucky for him, one woman that was sent to kill him would be able to help him out of his ordeal. Silas and Birdie Burnett decided to stick together and managed to go at it alone for a decent amount of time before joining Marcus' gang. It was during that time that Silas earned his nickname "the Bear," given to him by Birdie herself after she compared his demeanor and ferocity to that of a giant angry bear. Last anyone heard of him was that he was on the lookout for a fellow slave he loved, but that's not something he thinks will be possible anytime soon. Justitia. Last edited by Gecko on Fri Nov 16, 2018 6:31 am, edited 8 times in total. Ooooo... I love me some good old Cowboys x) count me in ? I'll get to making a CS right now! I just realised that there are two personality slots. Is it safe to assume that one is meant to be a bio? Mi yeah.. dont do drugs kids. Personality: John can be described as "Tough Love" in a human form. He has a caring air to him, but won't hesitate to put someone in their place if they were to step out of line. While he would rather not live life in danger, for one reason or another he always seems to find himself in trouble. He is a very open person when it comes to conversation, usually happy to answer any questions he is asked, thus making him easy to get to know. Weapons: John carries two Classic edition Peacemaker .45 revolvers and two Snake Brand Sheffield Bowie Knives, which he keeps in sheaths, both of which rest on his left hip. Bio: Honestly, there isn't a lot of his past that John talks about. All that is known is that he used to make knives for the local shops in his old town, and his business had ended up going under. When that happened, he found himself unable to find work, which left him desperate. So he resorted to finding an income by... Different means. Last edited by kanind on Fri Nov 09, 2018 12:06 am, edited 1 time in total.